Flying fear- Think your afraid to fly? You might not be! 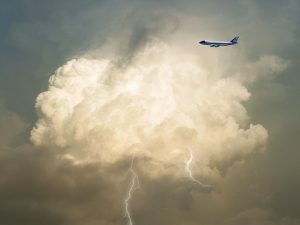 For a high percentage of those people that experience intense anxiety related to flying, there is something else that they are actually afraid of: a panic attack. Specifically, they fear having a panic attack while on the plane and not being able to “escape.” Even if people have never had a panic attack, they can develop this form of fear of flying. The core fear here is that somehow, some way, the person will “lose control” and “freak out” while on the plane. Obviously, if you are on a plane cruising at 30,000 feet, there is no way to physically remove yourself from that situation. Thus the fear intensifies, and people who experience this type of anxiety often describe worrying that they will “go crazy” because they are “trapped.” This leads to the anticipation of being embarrassed and mortified that they’ve had a “complete meltdown” in front of an entire plane full of people to witness it. Anyone who has ever had panic attacks can tell you that they are incredibly uncomfortable and upsetting to experience. People frequently fear that the panic attack will never end, that it will cause a more serious medical reaction such as a heart attack or stroke, or—once again—that they will go crazy and their mind will never be the same again. While the physical sensations of panic—racing/pounding heart, sweating, shaking/trembling, dizziness/lightheadedness, shortness of breath, chest tightness, feeling disoriented—are very real and can be distressing, no one has ever truly “lost all control” (whatever that even means) and “gone nuts” from a panic attack. So, for the most part, what people are afraid of happening if they do have a panic attack simply doesn’t happen. Every panic attack ends, no matter what. be able to leave wherever they may be if/when they panic. So it makes sense that this anxiety would be magnified in environments like an airplane, a train, a bus, or even an elevator—anywhere where their ability to up and leave is not entirely within their control. The good news is that there are highly effective methods of treatment for panic; in order to effectively overcome this form of flying fear, then, the person needs to work on the panic first. 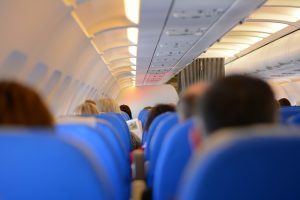 Fear of panicking while on an airplane is just one “subset” of flying fear, but it is one that can easily be treated with the help of a licensed clinician who is well-trained in CBT and ERP. Advances in the realm of Virtual Reality have helped with treatment as well, as we can now simulate scenes such as flying on a plane quite easily. Because of this, people can now practice facing their fears on a regular basis, whereas actually getting on a plane and flying consistently enough to extinguish any anxiety related to that simply is not practical for most people. If you or someone you know struggles with this fear, please know that now, more than ever, it very possible to overcome it.